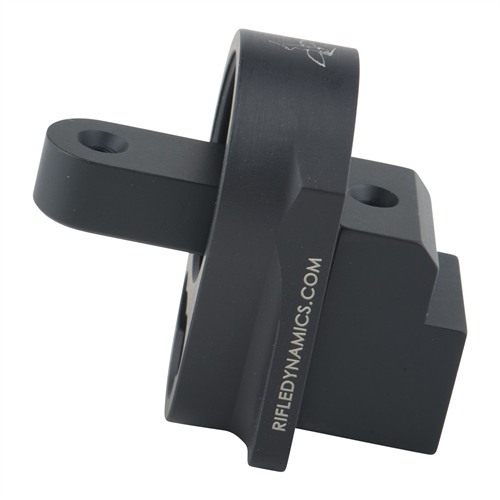 Jim Fuller and Rifle Dynamics have wanted to bring this stock adapter to market for a long time. Earl Pittman of IWC got involved and helped refine Fuller’s design to bring this project home. The Rifle Dynamics adapter offers the somewhat unique feature of allowing the use of an AR-15 end plate and different sling set-ups. This feature allows many different sling-mounting options for the individual users. Any sling adapter that fits on the AR buffer tube should work like the MagPul ASAP. This adapter is easy to install without modification to the AK with no need to cut off the stock tang, as it fits inside the adapter and tube. SPECS: Aluminum construction, matte black anodized finish. 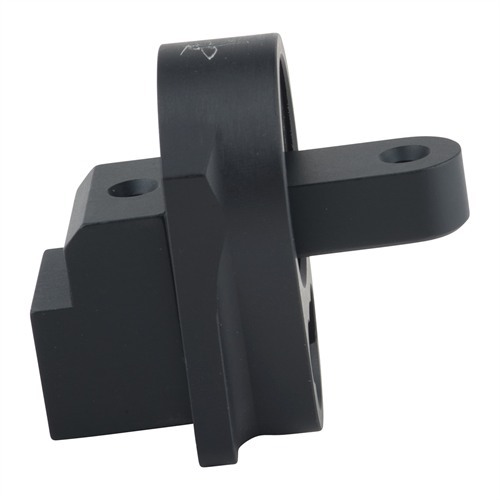 Fits stamped AK47/74 receivers with rear tang. Will not fit: Milled receiver, Chinese guns , PSL, Vepr, Yugo, any side/under folder stocked rifle, any receiver with stock tang removed. Jim Fuller i karabin Dynamics chciał wprowadzić adapterowi zapasów na rynek przez długi czas. Earl Pittman IWC zaangażował i pomogła w ustaleniu Fuller's design tego projektu domu. Karta karabin Dynamics oferuje nieco unikalną cechą pozwala na wykorzystanie płytę oporową AR-15 i chusta różnych Set-up. Ta funkcja umożliwia wielu różnych opcji montażu procy dla poszczególnych użytkowników. Dowolnej karty chusta, która mieści się na rury bufora AR powinny działać jak MagPul ASAP. Ten adapter jest łatwy w instalacji bez modyfikacji do AK nie trzeba odciąć ręki tang, jak to pasuje do adaptera i rury. Dane techniczne: aluminiowy, anodowany czarny matowy wykończenie. Pasuje do pieczęcią odbiorników AK47/74 z tyłu tang. Nie zmieszczą: bielonego odbiornika, chiński guns, PSL, karabin Wiepr, Yugo, lub pielęgniarce/folderze zaopatrzony karabin dowolny odbiornik z zapasów tang usunięty. I got one of these for my tantal. its a 2 piece bracket. attaching it is a piece of cake. and then all you need is to attach a buffer tube buffer plate and castle nut. it works with all kinds of AR goodies like sling attachment plates and you can even use a rifle buffer and a solid stock on it as well. if you want AR stocks on your AK this allows you any stock you want as long as you have the right buffer tube. A very well made & well fitted item, the reciever end cap/buffer tube attachment piece looks like it came on the rifle. Much nicer than the Vltor M4 stock adapter. The buffer tube is now inline with the barrel, which should help with recoil. The only downside is now the stock is now too high to use the iron sights (the stock rear sight or the Texas Weaspon Systems Dog Leg scope mount rear peep sight). 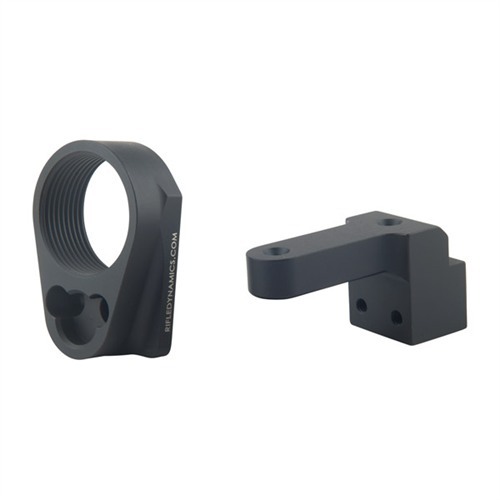 But you get a better cheekweld if mounting a scope or red dot (using either the side saddle scope mount or Texas Weapons System dog leg scope mount). Siaga w DPMS mil-spec tube & Mako GL-Shock. The Mako b-stock is heavy & wanted an adapter that's strong & can hold the weight & not complain with active days rolling in the desert. Rifle Dynamics does just that like nothing else can! It fit great with no drama. I recently purchased this product for a Saiga 308 conversion/build. Such an ingenious design, easily attaches to the weapon in a solid fashion. You now have limitless stock configurations to choose from and I'm still able to get a good sight picture using the iron sights. I will be purchasing more of these for current/future builds, you will not be disappointed by this product. Nicely machined piece and I have this mounted on my Romanian AK-74 with a Magpul CTR stock. It gives you a great height to use a scope or red dot but is too high to get a good picture on your iron sights and that is why I only gave four stars. If you don't plan on using optics go with the Vltor. If you do plan on using optics buy the Rifle Dynamics adapter. It does make it a steady rock solid mount for a buffer tube which then you can add any sort of stock on. However it raises the cheek weld too high and makes it hard to use iron sights. 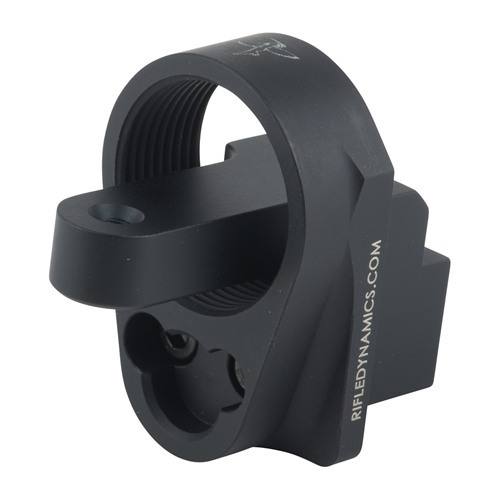 Like another review said you should get this for using a optic. I prefer iron sights but wanted a rock solid flush fit against my receiver. I installed this on my saiga AK47 and it was rock solid on. I would recommend this item to other people who wants to convert there AK to a t6 style stock. Great stuff as always from Rifle Dynamics. Installation was easy. Perfectly fit my WASR 10 AK-47. Looks like it was meant to be there. No machining marks at all. *Make sure to use Loctite on the screws. After 90 rounds the mounting screws loosened up. A little dab of thread locker took care of that. Nice adapter. Great conceptually. Little puzzled why the receiver portion isn't flush with the rear of the receiver and has to be shimmed with plastic washers which doesn't seem like a good solution. Why not extend it to fit flush or provide a shim with more bearing surface if that isn't possible? One piece would be awesome! Anyway, a nicely machined part that is the only one of its kind that I am aware of and will do it for me even if I have to develop my own shim. Ingenious design and I'm looking to use a holo instead of the iron sights so I want the (AR style) stock to be a bit higher. That and I'm looking to make my old MAK90 922(r) compliant so I figured I'd go with this design. Great concept and I'm sure it works for others but the screw holes on my MAK90 do not line up. One or the other, not both. The square base plug fits tight-ish into the opening so with the one screw it stays pretty solid. The plug didn't sit deep enough into the receiver so the screw was ever so slightly off center and the plastic washers stuck out too far to allow a flush fit. The block is light aluminum so I'm not going to try and muscle the screws in either. A couple of spare washers, a metal tie strap for the second hole and a lot of thread locker later it was on and tight - so far. Bottom line, would I put my life on the line with this product or take it deep into the wilderness? Not a chance. Will I jury rig the fit and take it to the local range? Sure, why not. I'd love to see this made out of stronger metal and blued instead of painted (the black scratches off very easily). 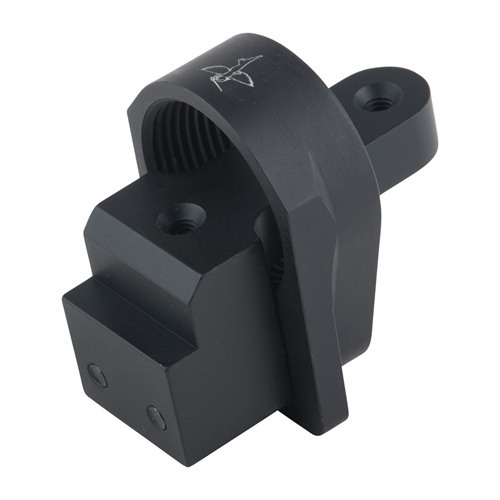 M4 Stock Adapter Black Aluminum Jim Fuller i karabin Dynamics chciał wprowadzić adapterowi zapasów na rynek przez długi czas. Earl Pittman IWC zaangażował i pomogła w ustaleniu Fuller's design tego projektu domu. Karta karabin Dynamics oferuje nieco unikalną cechą pozwala na wykorzystanie płytę oporową AR-15 i chusta różnych Set-up. Ta funkcja umożliwia wielu różnych opcji montażu procy dla poszczególnych użytkowników. Dowolnej karty chusta, która mieści się na rury bufora AR powinny działać jak MagPul ASAP. Ten adapter jest łatwy w instalacji bez modyfikacji do AK nie trzeba odciąć ręki tang, jak to pasuje do adaptera i rury.